Part of the award winning Auto+ shredder range, the Rexel Auto+ 750M Micro-Cut Shredder will shred up to 750 sheets of 80gsm paper into approximately 2,000 2 x 15mm micro-cut pieces. Simply load the paper into the shredder (you don’t even need to remove staples or paperclips! ), set it to run and the shredder will get on with the job of shredding your highly confidential and secret documents. A 4-digit PIN code provides security and peace of mind, so you can safely lock and leave your documents to shred knowing they cannot be accessed. The shredder is ideal for larger office environments with 20+ users and it has a high P-5 DIN security rating, ideal for the shredding of highly sensitive, confidential and secret material. The automatic shredding feature means you can also save valuable time and money in the workplace, as you don’t have to stand and manually feed the shredder. However, if you did want to use the shredder manually (i.e. for small amounts of shredding), there is a manual feed slot, capable of shredding up to 12 sheets at a time. 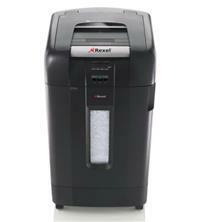 The Rexel Auto+ 750M has a large 115 litre capacity bin, which will hold up to 1400 shredded sheets. Plus, in addition to staples and paperclips it will also shred credit cards, CDs and DVDs - great if you need a shredder that shreds a variety of media. This heavy-use shredder comes with a number of handy features including: Auto oiling technology (the shredder automatically lubricates the cutting mechanism - you simply need to top up the oil when prompted with standard Rexel oil, product code 1760049); door open, bin full and cool down indicators; automatic jam clearance (the shredder will automatically reverse and forward the engine three times in the event of a jam); manual reverse option (should you require it); self-cleaning cutters (after emptying and replacing a full bin, the shredder will run in forward for 4 seconds, stop for 2 seconds and then reverse for 4 seconds to clear any remaining paper from the cutter mechanism); a separate CD/DVD tray to separate CD/DVD shards from your paper waste; intelligent power save after 2 minutes of non-use; and castors for easy portability around the office. Rexel recommend that your Rexel Autoplus 750M is serviced every 6 to 12 months by a Rexel service engineer - and the shredder comes with a 2 year guarantee on the machine and a 20 year guarantee on the cutters.